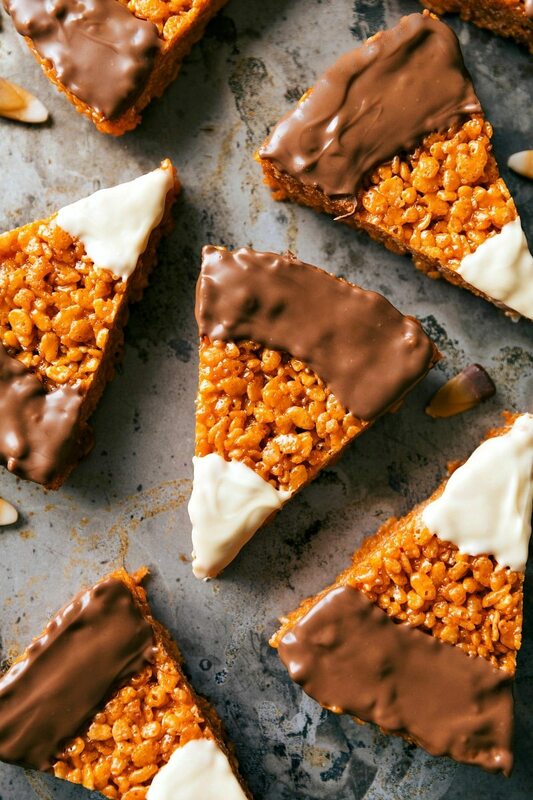 The absolute best peanut butter krispie treats decorated to look like candy corns with melted white and milk chocolate topping! The husband and the toddler adore candy corn. I seriously can’t think of a candy taste-wise that I like LESS than candy corn, but as far as their appearance goes, I love them! To me, they signify Halloween, fall-time, and trick-or-treating. As much as I hate regular candy corn, the peanut butter version isn’t too bad. 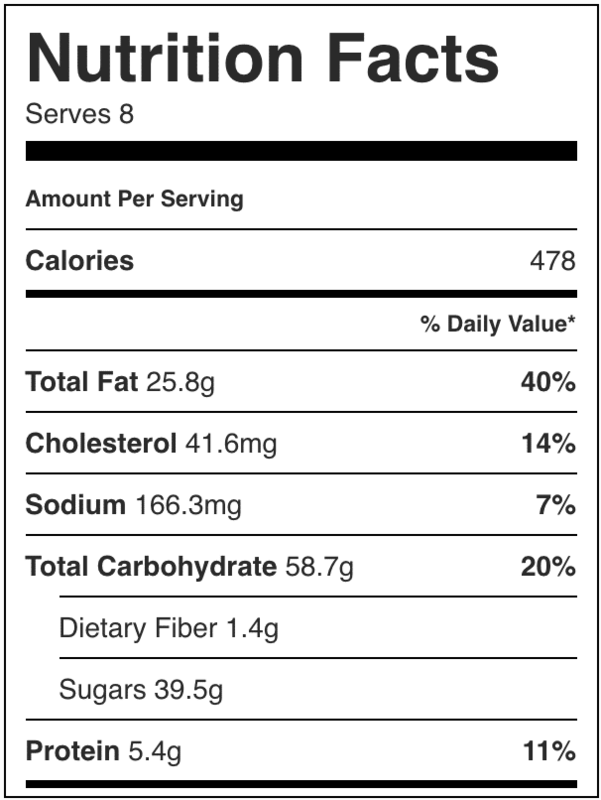 I’m 99% convinced that if you add peanut butter to just about anything it won’t be too bad ? In years past I’ve seen countless treats made to look like the regular orange-yellow-white candy corn, but I don’t think I’ve ever seen a treat made to look like the peanut butter chocolate candy corns. 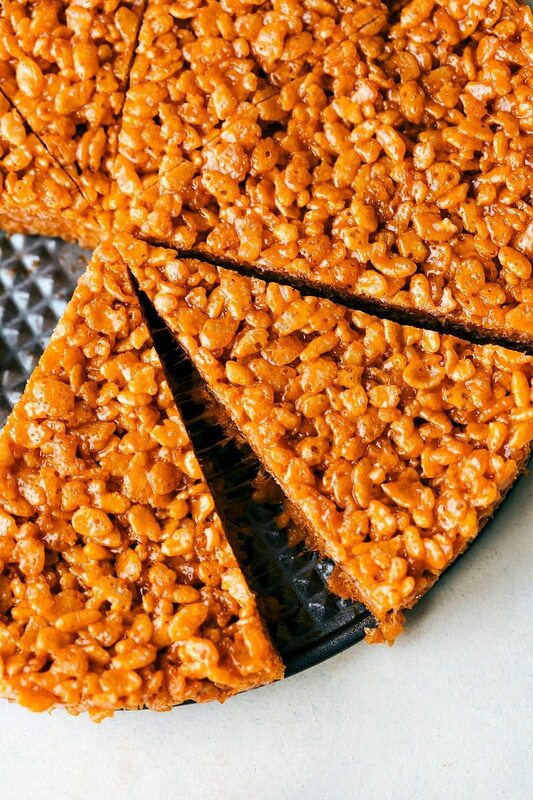 The base is a delicious peanut butter scotcheroo-type treat that is crazy delicious. With a little bit of food coloring you change it to a bright and vibrant orange. 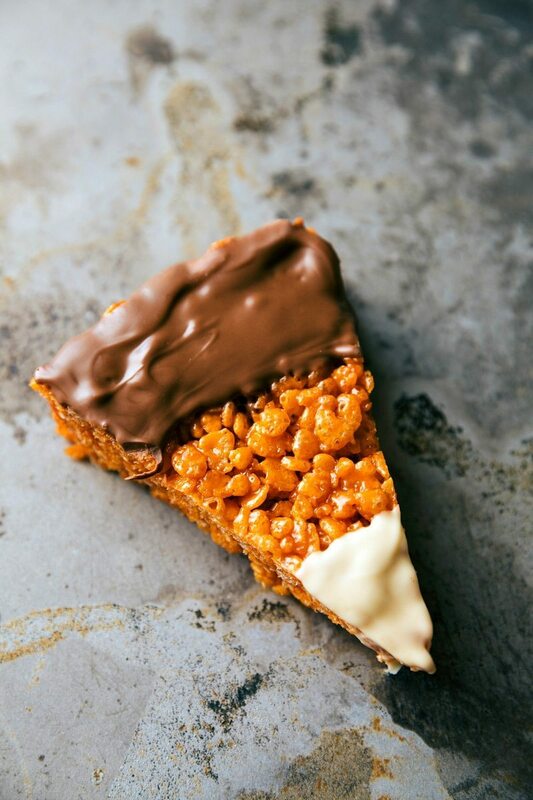 Once the treats are set up, they are cut out like a pizza and you top them with the two kinds of chocolates — milk and white. I also found that the best food coloring for these is a NEON Orange Food Coloring. You can mix to create your own orange with red + yellow, but if you want a super bright and vibrant orange then go with the neon orange. Try not to refrigerate or freeze these treats at any time. Let them set up at room temperature and let the chocolates harden at room temperature. Popping them in the fridge takes away their freshness a bit and makes them harder then when they stay at room temperature. Storing: airtight container; best within 2 days. ?? Prepare a round 8 or 9-inch springform or cake pan by generously spraying with cooking spray. Set aside. In a large pot, melt the butter. Stir in the brown sugar, heavy cream, and salt. Bring to a boil over medium high heat stirring constantly. Boil for just one minute and then turn the heat to low. Stir in the 1/3 cup of the peanut butter, vanilla, and food coloring. Stir until combined. Add in the marshmallows and stir constantly until they are melted. Remove from the heat and add in the rice krispies. Stir until the cereal is well coated in the mixture. Press the mixture gently into the cake pan. 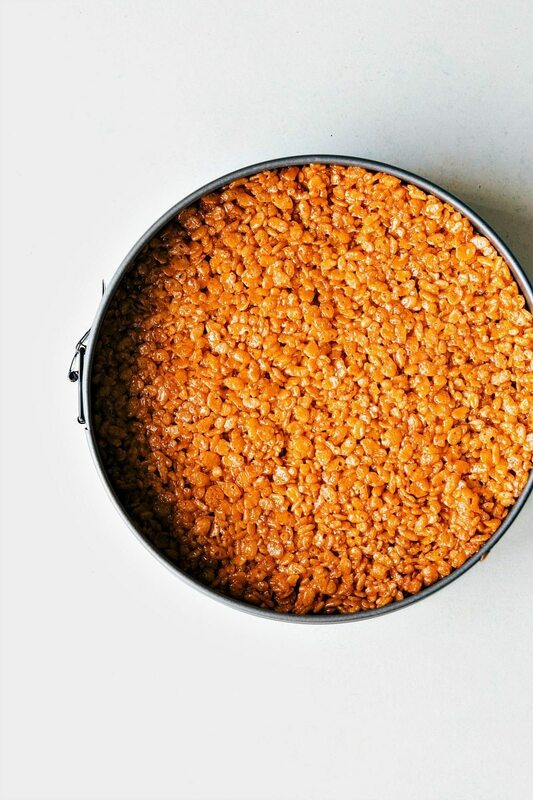 You want to compress the krispies but not too much that they become hard. Spray your hands with cooking spray to help push the treats in. 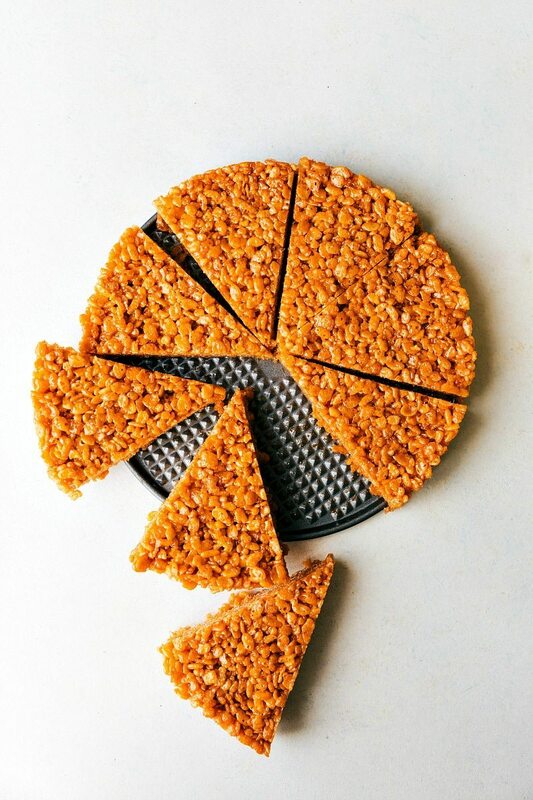 Remove from the pan by inverting (cake pan) or removing the sides (springform). Cut like a pizza to form 8 triangles. Grab 2 separate bowls. Fill one with the milk chocolate and 2 tablespoons of peanut butter. Fill the other with white chocolate and remaining 1 tablespoon of peanut butter. Melt in the microwave in bursts of 15-20 seconds stirring in between each burst until completely melted. Dip or spoon the milk chocolate over the bottom of each triangle and the white chocolate over the top of the triangles. Allow the chocolate to set at room temperature. Ah I LOVE candy corn, and I’ve actually never had the peanut butter version (definitely going to be on the lookout for that). This rice krispie treat candy corn is so cute and genius! These are so fun! 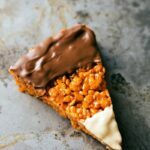 i love making Rice Krispie treats and can’t wait to make these for my boys! Just pinned this for my girls . . we love this idea! can’t wait to try this recipe! These look so fun! Very creative and perfect for Halloween!